Purim is my absolute favorite holiday and it's approaching!! I know because I own a calendar and also because that's when the entire internet seems to be busting at the seams with new variations on classic Hamentashen. Think of any food in the universe and odds are, someone turned it into a Hamentash. The creativity is nothing short of astounding and each one looks and sounds more delicious than the last. For a great comprehensive guide, check out this list. Number 81 bring us here, to this blog post. I originally created the recipe for the Purim issue of FYI Magazine in 2016 (photo credits to Shevy Gross Photograpghy). 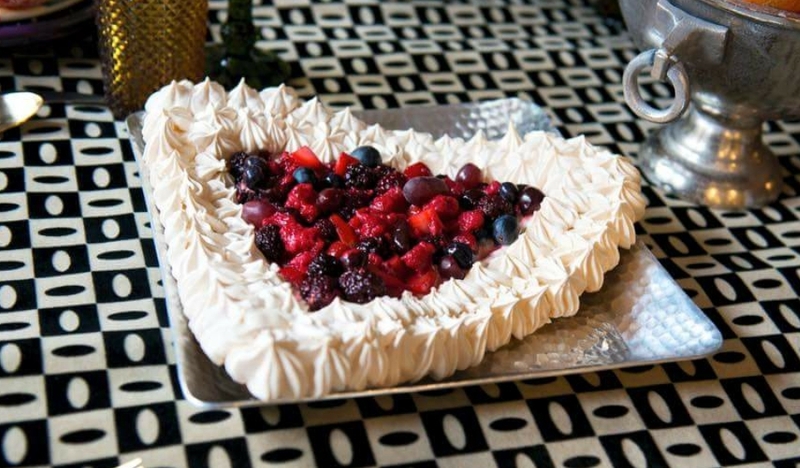 It's a giant Hamentash-shaped meringue with whipped cream and mixed berries and will make the most fabulous addition to your Purim dessert table. Of course, you can make this in any shape or size and serve it any other time of year, including the holiday which shall not be named. Passovoldemort. *gasp* Just swap potato starch for corn starch and you're good to go. Meringues may be somewhat intimidating but they're actually very simple. Here are some tips. To get eggs to come to room temperature in a hurry, place them in a bowl of warm water for a few minutes. Be sure your egg whites remain grease and yolk free or they won't firm up right. Separate your eggs carefully and be sure your bowl and beaters are clean and dry and you'll be rewarded with perfection. Not great at freehand? You can draw a triangle with a pencil directly onto the parchment. Turn the parchment over and use it as your guide. All components may be prepared several days in advance. Store them separately until ready to serve. Beat the egg whites on the highest speed until just stiff. Add the sugar 1 tablespoon at a time, mixing well to incorporate each addition before adding the next. In a small bowl combine corn starch, vanilla extract and lemon juice until smooth. Fold into egg white mixture. Turn off the oven and allow to cool in the oven with the door slightly ajar. Prepare the topping. Whip the topping, set aside. Toss the berries with the sugar, set aside. 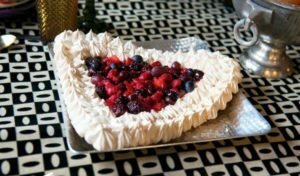 To assemble, spread the whipped topping in the well in the center of the triangle as far out to the sides as you'd like making sure to maintain triangular shape. Top with mixed berries, again making sure to maintain triangular shape. Enjoy immediately.